Now Mercury Free – We are excited to announce that we are now only stocking Mercury Free hearing aid batteries. This new generation of batteries is not only better for the environment, but in preliminary tests, they have been proving to last slightly longer than our previous generation. These batteries will insure that you get the maximum performance from your hearing aids. Get your new Mercury Free batteries in boxes of 60 and save $25 over the normal price. 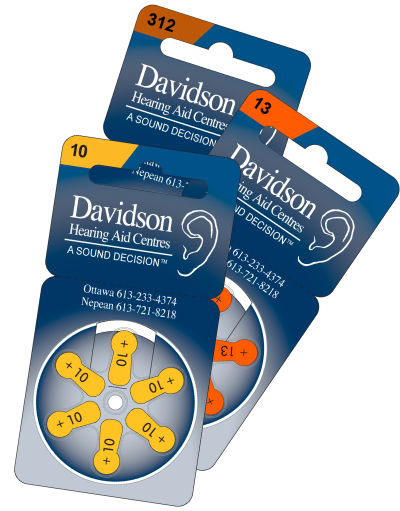 Battery Plan – Davidson’s includes a 3 year supply of batteries with the purchase of your new hearing aids. That is 186 batteries per hearing aid in the Good, Better or Best performance levels. See clinic for full details. Battery Sizes – Hearing aid batteries come in four different sizes. Below is a list of the sizes, the models that each is typically found in, and the expected battery life of each size. Disposing of Batteries – We recommend that you recycle your old hearing aid batteries. We have a battery recycling collection at all of our clinics, so you can easily drop them off the next time that you come in and we will recycle them for you. Rechargeable Batteries – We also carry replacement rechargeable batteries for Signia and Siemens hearing aids in our offices as well as the Z-Power batteries used by Widex, Starkey, ReSound, Unitron and Oticon. Further to this, we also have the new Phonak hearing aids with their built in rechargeable batteries. Here are a few ways that will help you to maximize the life of your zinc-air hearing aid battery. Battery Tip – Take the sticker off of your new battery and leave it for 2-5 minutes to fully activate it before inserting it into the hearing aid. This will provide you with a longer battery life. 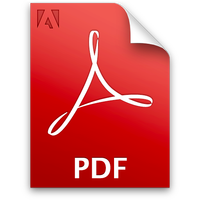 Click on the link above to see a video explaining why you should wait before inserting the battery into your hearing aids. 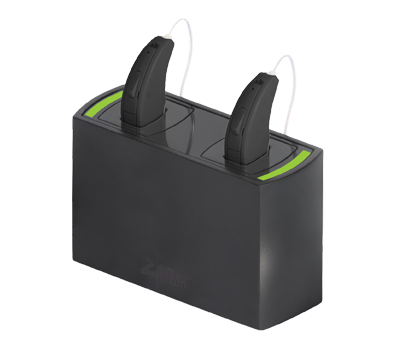 The Z-Power rechargeable kit is now compatible with several of the most popular RIC style of hearing aids. The following is a list of these products. Click here for the best practices for using and storing Z-Power batteries. Oticon has produced some excellent videos on use and best practice tips for Z-Power Batteries. Batteries are available at all of our offices or can be ordered by phone and mailed to you. Please call us at 613-233-3149 to place a battery order.